On January 21st, 1958, Charles Starkweather drove to the house of his 14 year old girlfriend Caril Ann Fugate in Lincoln, Nebraska. She was not there, but Charles got in an argument with the girls parents, and ending up killing both of them as well as their two year old baby daughter. Over the next 8 days, the two young lovers would embark on a murder spree through out Nebraska and Wyoming, leaving eleven total victims in their wake before being captured. These events terrorized the nation, and seemed to signal a dark end to the narcotic peacefulness of the 1950s. 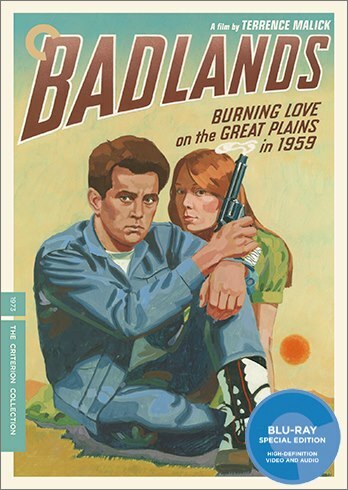 It also inspired a number of books and films, most notably Terrence Malick’s “Badlands“ in 1973. The film opens with 25 year old Kit Carruthers (Martin Sheen), working his garbage route in a small town in South Dakota, sifting through the trash and making bored comments about the contents within. He catches the eye of 15 year old Holly (Sissy Spacek), dancing and spinning a baton in the middle of the street, and they strike up an unlikely relationship, much to the chagrin of her father, played by Warren Oates. After a confrontation at her house, Kit kills her father, and they set off in his car, now fugitives from the law. Loosely following the events of the Starkweather killing spree, they find themselves in one violent situation after another until a climatic shootout with the authorities in the wastelands of Wyoming. 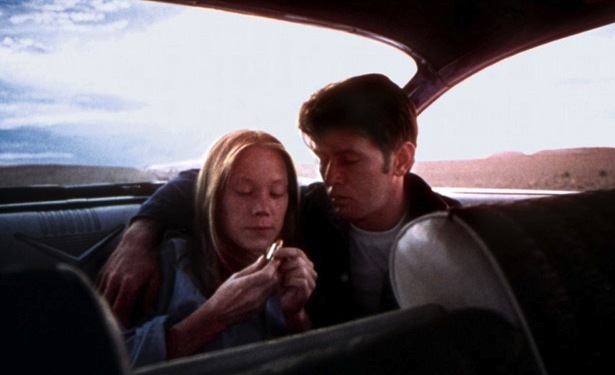 Enigmatic director Terrence Malick was only 28 years old when he filmed his debut feature Badlands, but the confidence and craftsmanship of a true cinematic master were already on full display here. 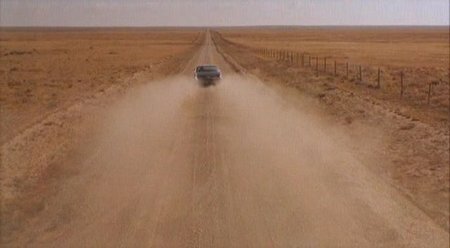 As shown in his later works like “The Thin Red Line“ and “Days of Heaven“, one of Malick’s major themes is the exploration of violence and its connection to nature and natural beauty. The main thread of imagery in “Badlands“ appears to be concerned with animals, and with the disposable quality of their lives. The film opens with Kit poking a dead dog with his foot and offering a co-worker one dollar if he eats it. Later, Holly’s father takes her beloved dog out to a field and shoots it to punish her for seeing Kit (he then drives out to a bridge and throws a sack filled with the dead canine into the river). Holly takes her sick catfish and callously tosses it in the backyard to suffocate to death, Kit plays around with a dead cow on the feedlot, and throughout the film are images of broken birdcages, lizards and chickens, both dead and alive. Malick draws parallels between the characters disregard for animal life and the later casual nature of the killings. The violence in the film is not stylized, but sudden and ugly and cowardly, as each bloody encounter begets the next in a naturalistic cycle of life and death. Kit seems to be the one in charge, but Holly’s innocence is slowly eroded by these actions and her beauty is tarnished by the violence, as when a gorgeous, cloud-filled vista is torn in half by Kit’s Studebaker racing across the landscape. “Badlands“ succeeds on other levels as well. Sheen and Spacek are simply excellent here, capturing perfectly the awkwardness of teen love, and the visceral excitement of being on the lam. Sheen seems to be channeling James Dean (who Starkweather himself was said to be inspired by), while Spacek, in one of her first major film roles, shines as the wide-eyed, idealistic Holly, hypnotized by the charismatic Kit. The cinematography, as usual befitting a Malick film, is simply breathtaking. From the wide screen vistas of Montana and Wyoming, to a gorgeously shot sequence of a burning house, every frame of this film seems to have been slaved over. The soundtrack is also essential here, especially the repeated theme of Gassenhauer by Carl Orff, a beautiful track played mainly on xylophones that was later memorably reworked by Hans Zimmer for “True Romance“, another film about young lovers on the run. 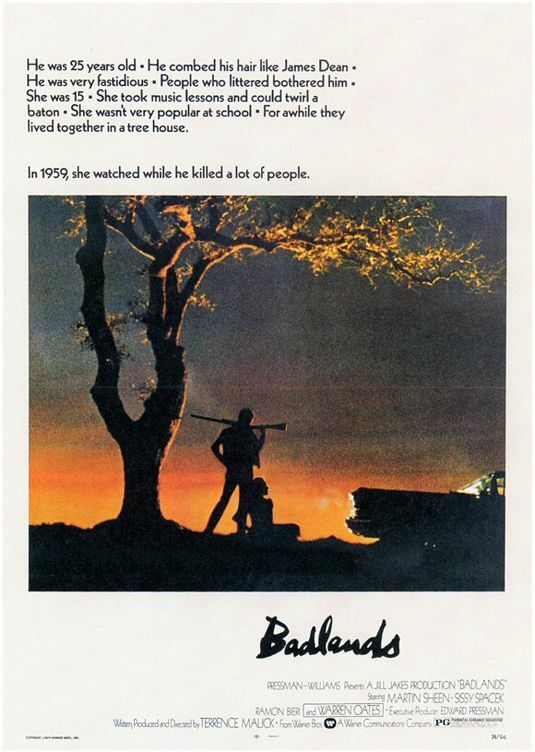 “Badlands” and the Starkweather spree have been very “influential on later filmmakers, and can be seen on everything from “Natural Born Killers”, “Kalifornia“ to “True Romance“ and “Raising Arizona“. This long overdue Criterion edition is, as always, a sumptuous treat for film fans. 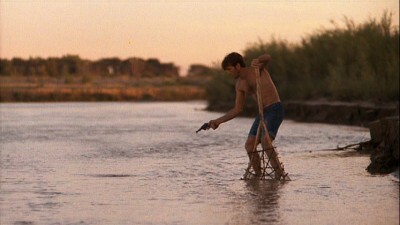 The restored digital transfer, approved by Malick, trumps all previous versions of the film and is a wonder to behold. Also included are interviews with the editor, a making-of documentary, and my personal favorite, the 1993 episode of “American Justice” about the real-life Charles Starkweather case. And a booklet with a great essay by Michael Almereyda reveals among other things, that the man who visits the mansion with a blueprint under his arm is none other than Malick himself in an uncredited cameo. Matt Streets saw his first film in 1980, when his parents took him to see Robert Altman’s “Popeye” at the Tivoli Theater in Downers Grove, IL. Since that rocky start, he has become a lifelong movie fan, and has written film reviews on and off since giving “Medicine Man” two stars for his high school newspaper back in 1992. He is currently attempting the insane feat of watching every single film in the Criterion Collection as The Criterion Completist.